Successfully Added Media Pro HD - 1080P Networked HDD Media Player (Dolby, DTS) to your Shopping Cart. Introducing one of the most potent HDD media players on the market, the Media Pro HD. What really makes this media player so special is its ability to connect to any home network wirelessly via USB Wifi, or by Ethernet cable. 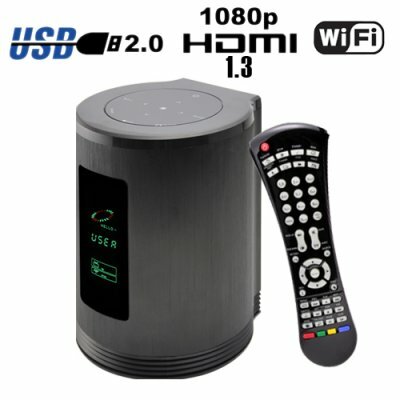 This allows you to easily access and play media files from any computer on your home network, access streaming music or videos, play YouTube videos and a whole lot more! And to top it off, the graphical user interface (GUI) is so simple to use that even first time users will have no problem controlling all of the cool features the Media Pro HD has to offer. At the heart of this machine is the powerful Sigma Designs SMP8635 CPU and the Silicon Image SiI9134 HDMI 1.3 transmitter-- which is usually found in top of the line Blu-ray players and A/V receivers. This is what allows the Media Pro HD to easily playback stunningly gorgeous full HD 1080P movies, crystal clear Dolby True HD and DTS-HD surround sound audio, 3D over HDMI, Deep Color 36-bit color depth, and resolutions up to 1080p @ 60Hz or 720p/1080i @ 120Hz— all without any hesitation or delay. Simply put, if you want the highest quality audio and video possible, then the Media Pro HD is the right media player for you. The Media Pro HD is an extremely well built machine. Every aspect from the attractive and durable brushed metal casing to the next generation hardware have been carefully designed to bring you one of the nicest HDD media players on the market. Obviously the Media Pro HD is not the cheapest HDD media player available, however, for roughly $200 you are getting a lot more than you are paying for. Even media players costing $300 or more like the PopCorn Hour C200 or the HDI Dune can not match the combination of power, quality, and features found in the Media Pro HD. And unlike other HDD media players, the Media Pro HD actually comes with a 12 month guarantee and is in stock now. Order one today and we will express ship your order by tomorrow. Extensive online functionality, including file sharing, streaming movies, news, internet radio, photo sharing, and much much more. How is this unit different from the E49 Media Tank or E55 Media Blitz? The Media Pro HD shares all the great features of the E49 and E55 but goes one step further by providing a touch panel user interface so that it can be used without the remote control. This can be very useful if you loose your remote or the batteries die. The Media Pro HD also features a coaxial surround sound digital output not found in the other two players, and the design is also much sexier and more compact. Hey, this looks exactly like the EGREAT EG-M35A Networked Media Tank. Is it the same device? Can I use the Media Pro HD without an internal hard drive? Absolutely. The internal hard drive option is just a luxury, feel free to watch all the movies on your PC directly from the Media Pro HD. Definitely, with support for up to a 2TB HDD, you can back up everything you want and more. The Media Pro HD is also small enough to carry with you wherever you go, meaning you'll be taking this thing to your office in the morning and bringing it back at night. Which online services come preinstalled? SHOUTcast.Radio, Flickr, FrameChannel, Mediafly, Pike Photo, Cnet TV, WeatherBug, Blip.tv, Photobucket, Yahoo Weather, Revision 3, Picasaweb, SmugMug, Motorz TV, Cranky Geeks, Radiobox, Mevio, iPodcast, CNN- In Case You missed It, CNN- The Larry King Podcast Live, CNN- Anderson Cooper 360 Daily, CNN Daily, NBC News Today Show, BBC Podcast, NBC Nightly News, CBS Evening News,23 Photo, Bloglines, Live365 Radio, PodfinderUK, Yahoo traffic alerts,Video Cast, Yahoo News CNN News, ABC News, Break Podcast, MSNBC News, Cinecast, Traffic Conditions, Indiefeed, Jamendo.